Recipes in Season | Ask The Food Geek - Seasonal & simple... usually! Sweet potatoes get VIP treatment with a soup designed to highlight every aspect of the root’s characteristics. This seemingly humble soup really steals the show – not bad for 6 ingredients! You might think that having so few ingredients leads to a bland soup (because for some recipes, that’s true). 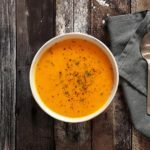 But this soup is different: the short ingredient list is purposefully designed to enhance the natural flavors of the sweet potatoes.